Technology Mutual Funds are funds that invest their money in leading technology companies. You must be aware that we have already entered in the era of Industry 4.0. A new technology disruptions such as IoT, Digitalization, and Artificial Intelligence are taking charge of traditional technologies. It clearly indicates that the future of technology business will be bright and booming. The government of India is also pumping a lot of money for converting India to Digital India. Almost every IT company will get benefits out of it. Thus it is a very good idea to park your money in the technology business. Technology Mutual Funds are equity mutual funds that invest in IT companies that are involved in technology businesses. Few examples of technology businesses are IT digital transformation, technological service industry companies, as well company involved in doing business in the area of data analytics, artificial intelligence, and machine learning. 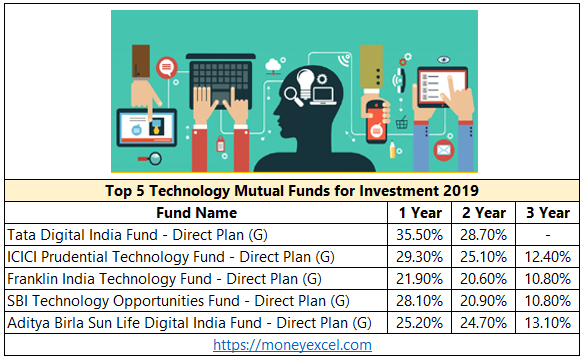 Top 5 Technology Mutual Funds for Investment in 2019 are given below. The first technology fund for investment is Tata Digital India Fund. It is a relatively new fund but has given magnificent returns during last one year. The objective of this fund is to invest 80% of the fund in equity related instrument of the companies in the Information technology sector. This fund has consistently outperformed its benchmark S&P BSE IT since its launch. This fund has a low expense ratio. ICICI Prudential Technology Fund is one of the oldest technology sector fund available in the market. The objective of the fund is to invest in the equity and equity-related securities of technology and technology dependent companies. A large share of the AUM will be invested in the stocks under the Benchmark Index. This fund has historically given consistent two digit returns to investors. 70% investment of this fund is in large cap IT sector companies. Franklin India Technology Fund is the next technology fund. The objective of this fund is seeking above-normal capital appreciation through investments in high quality, fast growing companies in the information technology sector. The expense ratio of this fund is slightly higher. SBI Technology Opportunities fund is diversified mutual fund that invests in technology or technology-related companies. The past performance of SBI technology fund is very good. The major holding of this fund includes Infosys, HCL and TCS. The expense ratio of this fund is low. Aditya Birla Sun Life Digital India Fund is one of the best technology funds. This fund has given magnificent returns in the past. This fund follows value and growth investing strategy. This fund has a very good mix of diversified IT companies. The expense ratio of this fund is slightly high. Also Read – Thematic Funds, Sectoral Mutual Funds – Good for Investment? You should consider following important points before investing your money in Technology Mutual Funds. Technology funds are sectorial fund and risky in nature. If you are a new investor you should avoid these funds. Your investment in a technology fund should not exceed 5-8% of your total equity portfolio. Make sure to evaluate fund holding carefully before making the investment. Fundholding company should be a leader and involved in the evolution of digital initiatives. Don’t blindly invest in the fund with the highest returns. Invest based on the duration you want to invest for. Invest via SIP route only. It is advisable to go for the direct fund in the growth category. You should consult financial planner with good knowledge of IT sector for investing in Technology Mutual Funds. Review your investment on regular basis and make changes as required. Future of technology sector is bright and it is on growth trajectory. You should keep your eyes open and grab the opportunity to invest in good technology funds. Do you invest in Technology Funds? « How to Switch Off Credit Card & Debit Cards temporarily?